You’re domain is running on pre-Windows Server 2008 R2 domain controllers. After enabling the BitLocker Password Recovery Viewer feature on Windows 7 or Windows Server 2008 R2, the Recovery Password tab may not show in the computer properties dialog in Active Directory Users and Computers (DSA.MSC). When the Active Directory domain does not have any Windows Server 2008 R2 domain controllers, Active Directory is missing the BitLocker Recovery Information display specifiers. The BitLocker Recovery Information Display specifiers must be populated in the domain in order to show the BitLocker Recovery tab. You can manually populate the display specifiers by registering BdeAducExt.dll. 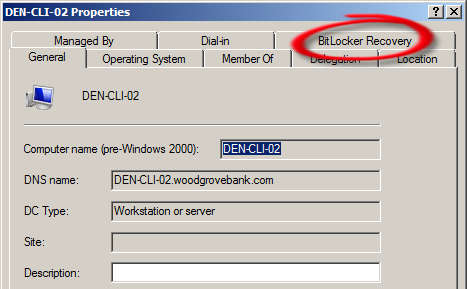 You have to register the DLL logged on as a member of the Enterprise Administrators on a system running Windows Server 2008 R2 or Windows 7 with the BitLocker Password Recovery Viewer feature enabled. Run the following command to populate the display specifiers: “regsvr32.exe BdeAducExt.dll”. The display specifiers for BitLocker Recovery Information are automatically populated when a Windows Server 2008 R2 domain controller is installed in the domain. This entry was posted in BitLocker, Windows 7, Windows Server 2008 R2. Bookmark the permalink. I am unable to get this ADUC tab to appear on our administration servers which is a member server running Server 2008 R2 Enterprise and is also an RDS (Terminal) server. I am successfully able to view this tab on one of our R2 DCs, but no matter what I try it will not appear on this administration server running RDS. I have the recovery viewer installed on both this server and the DC mentioned as well as I have registered the DLL on both as well. I still can only see the new ADUC tab from the DC.